Hello everyone, welcome. Today I was planning on writing about a recent game of Lords of Waterdeep, however it occurred to me that I did that already a while back (HERE), and the game happened a few weeks ago which made it harder to remember the salient details, even with snapshots and notes. So, instead, I decided I would write a post that I have been wanting to write for a couple of months now but had been waiting as something hadn’t happened yet. I wanted to write about the physical tools I use when creating and running an RPG. My actual Games Master’s Toolkit, as it were. Now, before I start I should point out I have written about software (such as Inspiration 9) and a browser based campaign manager Scabard. Both of these were, and are good tools. However, there is something to be said for being able to hold the NPC character sheets in your hands; something to be said for having the adventure written in a book that you can refer to and go back to read for pleasure later. Plus, as much as I liked Scabard particularly, I sometimes found having 15 tabs open for character sheets and locations etc distracting. Plus, never underestimate the power that nostalgia has (I wrote about that HERE). Disclaimer, there are a couple of affiliate links to Amazon.co.uk in this post. So, my toolkit. Dice really can go without saying. I also have a dice rolling tray to stop the pesky little things falling off the table, but that simply prevents annoyance at the table rather than adding to the game. Let us talk about some things that are more helpful. Let us start with my GM screen. It is available in other colours but the green one was cheapest. The screen has 4 panels, with room for inserts. Annoyingly the insert space is slightly smaller than A4 so I had to guillotine my inserts so they would fit. I had already purchased the PDF of the Vampire; The Dark Ages screen so it was easy enough to print and stick it in. (Note, it came with inserts. I think they were for Pathfinder). I then custom built an insert, using MS Publisher. This tracks key stats for the player characters (this is for a solo player game), such as Health, Willpower and Bloodpool. I have also noted status effects that affect the character so I don’t forget. In the event that status effects change (the other stats are less likely to), I can either print off a new insert or I have a roll of food labels. I can simply peel one off and cover the old effects and write in the new. I can do this as often as needed. The 4 panel screen inserts are also usable with Dry Wipe markers so during game I can write on the screen changing stats etc. I have a supply of Dry Wipe Markers because I bought a pair of whiteboards. Speaking of NPCs, I like to keep track of the recurring NPCs by location, so I keep a ring binder for each campaign. There is a contents divider at the front, with names of key locations on it. When players go there, I can simply turn to the appropriate section and flip through the NPCs. I also keep copies of the PC character sheets at the front of the binder. For each location, I have created another custom MS Publisher file where I can simply write in the details of lower level NPCs. You can click the image to download the file. It is Publisher 2007 for compatibility queries. These sheets are for the frequently recurring, but lower level NPCs that really aren’t likely to be individually antagonistic to players and are likely to lose if it came to conflict. More powerful NPCs get their own sheets, though for some games I might only write a statline and brief bio. Of course, as frequent readers will know, I don’t write every eventuality and my players frequently surprise me. That is where the next items come in handy. When I am running games and I need to introduce someone or something new, I have a stack of Notecards handy. As I introduce the new thing, I quickly write it down on a notecard with basic details and carry on with the game. If it is a new NPC, I will add it to my folder later. If it is a significant event or action taken by players, well, I will tell you in a minute what I do with that. I keep blank notecards in one of the plastic wallets, whilst I use other wallets for stock locations and people. Now, we come to one of my favourite tools. My campaign books. Any notebook will do, though I am a bit of a notebook snob so I went with these ones from Rymans, a UK Stationery shop. 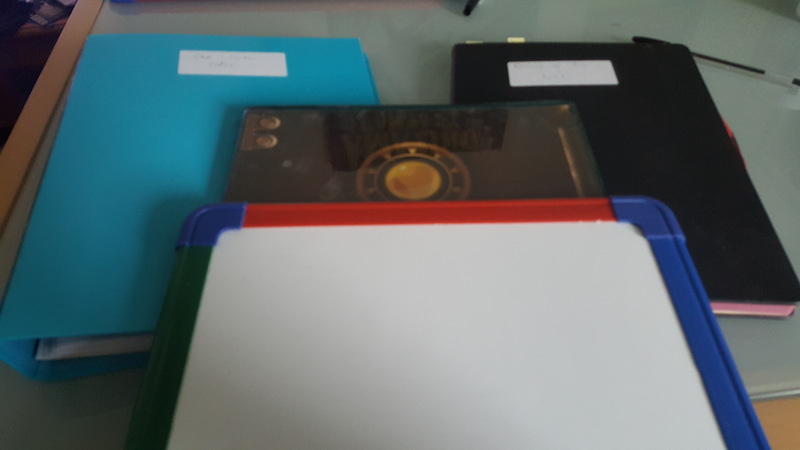 Though I only bought them when they were on sale as they are expensive, however the paper quality is good which encourages writing, they have a bookmark, a loop for a pen and an elastic band to keep them from falling open. The cover is also solid so I can realistically write anywhere. What I do is I tend to write some of the lore of the world, its cosmology and what is happening that directly relates to the players and then I write a second intro that is more zoomed in on the player, and then add in a few events that are going to happen in the near future of the campaign. I will tend to write basic npc stats in the book, if not dealing with a main npc. Here is the fun part. If a player does something that affects what I have written in the book and there is no room for me to write it in (it is in the middle of a description), then I write the player action on one of my note cards and staple it to the page. Eventually that might prove to be an issue, but not yet. I also use little post it bookmarks on my campaign book so I can quickly find important details. Last of all, I have a box file for storing the things like notecards, wallets and things that are cross campaign. I have to say, the one I bought wasn’t great as the spring broke when I put stuff under it but that is life. I imagine I may put some stock maps in the file for future encounters, but of the tools it is probably the one that is least important in my list. Anyway, there we are. Those are the bits and bobs I use to create and run games, whether face to face or even using roll20. I hope there was something of use in this post for the aspiring Games Master. Let me know in the comments what you do differently. What a useful article. I like the panel, I can see the difference in the four panels versus the two or three. The whiteboards are super useful for visual stats.